We’re smack in the middle of vacation season, which means you may soon be jetting off to another location, perhaps with an entirely different climate. You’re probably thinking of all the sights you’re going to see and the fun you’re going to have, but we encourage you to think of one more thing: your skin. How might the new climate affect it? It may seem like a small concern now, but when you arrive at your destination, if you end up with acne or dry, dull skin, you won’t be happy. Fortunately it takes only a few preparations to make sure you and your skin will be in tip-top shape! Depending on which type of climate you live in now, and which type you’re traveling to, you may be asking your skin to make a big adjustment. In warm climates, heat and humidity can increase sweat and oil, increasing risk of acne breakouts. But if you’re going to be out in that sun, you have to be cautious about when you apply certain products to avoid making your skin more sensitive to UV-damage. Warmer climates can also make you more susceptible to skin infections and inflammation, particularly if your diet changes as well, which it usually does. Warmer conditions are friendlier to bacteria and other microorganisms, which can leave you vulnerable to bacterial, viral, and fungal skin conditions. If you have allergies, going somewhere new may result in a rash or hives if you touch something unexpected. Contact dermatitis is more common and more problematic in high temperatures, which can also cause more rosacea and psoriasis flare-ups. If you travel to a cooler climate, on the other hand, you may end up struggling with dry, dull skin, and again, you may struggle with acne breakouts, because your skin may try to adapt by producing more sebum (skin oil) for moisture. If you go from a humid climate to a dry one, your skin will also struggle with dryness, which could make you see fine lines and wrinkles you never knew existed. Dryness can cause itchiness and redness, too, and you’ll be compelled to scratch, which came make you feel worse. Eczema easily flares up in dry weather, which is just what you don’t need when trying to enjoy your vacation. 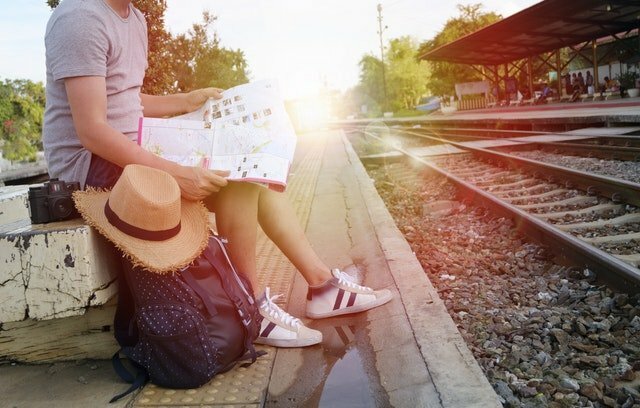 Traveling is stressful in general, and we now know that stress shows up on skin via dryness, flakiness, and acne. So what can you do to keep your skin looking healthy? You don’t want to make drastic changes to your skin care, as that can make your skin freak-out. You can take a few precautions, though, to help your skin adapt while you’re gone. This is one of the biggest challenges while traveling. For many reasons, you may end up dehydrating yourself and your skin. You may forget to drink water, or you may indulge in more cocktails than usual, and alcohol is drying. Your diet may consist of fewer hydrating fruits and veggies, and if you travel by plane, that’s drying to begin with, which means your skin starts out already behind. Drink plenty of water, and consider taking along a hydrating spray like our Rescue + Relief Spray. You can use it under or over makeup at any time as a refreshing, moisturizing mist, to help your skin manage until you get to your destination. It also works great if you’re outside on a hot, dry day. And it comes in a travel size, so you can take it with you in your carry-on. Just be sure not to mist with plain water. It will evaporate and leave your skin dryer. If you travel to a hot and humid climate, you’re probably going to end up sweating more than normal. If you’re acne-prone, take along some soothing, cleansing wipes to help deal with that oiliness during the day. At night, try a clay mask to help soak up that oil and rebalance your skin, and use it as often as needed. It may also help to take a travel-sized charcoal brush with which to wash your skin. It helps naturally exfoliate and keep your pores clear. If you’re traveling to a cooler, drier climate, and you’re used to a warm, humid climate, realize that you may need extra moisture. If you’re already living in a dry climate, your skin will probably adjust just fine, but if you’re used to more humidity, expect your skin to act differently in the dry air. Our Calming Moisture and Body Repair Lotion work great in either climate, but if you need a little more moisture, consider taking along a natural oil serum to use before your moisturizer. Our Restorative Skin Balm also helps treat chapped lips and dry cuticles. No matter what time of the year you may be traveling, you have to remember to protect your skin from UV damage. If you’re going to a hot and sunny locale, you may be exposed to the sun more than you usually are, and that can result in sunburn and sun damage within 30 minutes or so. Take along your SPF formula of at least 30, and look for those with zinc oxide or titanium dioxide, as these are the safest types. Whatever you use, be sure to reapply at least once every two hours—most often if you’re sweating or swimming. If you’re traveling to a windy, cooler climate, you could end up suffering from redness, dryness, and itching, irritated skin. Wind and harsh weather can wreak havoc on skin, particularly if the air is dry. Pollution also increases risk of skin damage, so if you’re going to the big city, realize that you may suffer from increased flare-ups or irritation. Protect from harsh weather with scarves and clothing, and make sure your cleanser is a gentle, creamy type that won’t further stress skin. Ease up on the acids if you use them (salicylic, glycolic, malic), and form a protective layer on skin with rich moisturizers. Our Calming Moisture and Body Repair Lotion both have natural anti-inflammatory ingredients that will help calm and soothe skin. If your skin really suffers in the dry climate, try a natural cocoa or shea butter moisturizer at night. Watch your diet, too. Try to stay consistent with your fruits and veggies, as they contain powerful antioxidants that can help neutralize damaging free radicals from pollution and stress. How do you care for skin when traveling to other climates? Are You Avoiding the Sun Too Much?